Concrete cleaning is recommended bi-annually to ensure the durability and functionality of your concrete surfaces. As concrete is prone to cracking if not properly maintained, it is important to oversee that its cleaning is completed by professionals who are skilled in the art of pressure cleaning. Pressure cleaning helps to remove small amounts of dirt and debris that can easily build up in the tiny crevices of concrete’s outer layers. 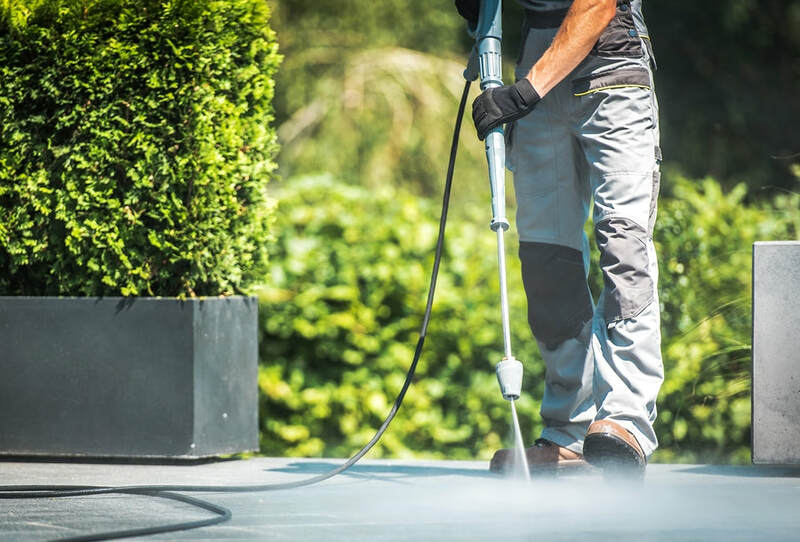 Even for dirt or debris that is not solid, like oil or gasoline buildup, pressure cleaners are able to help remove the stains and damage from concrete’s surface. Pressure cleaning helps rid patios of dust and dirt that accumulates from outside. Outdoor surfaces such as pavement, driveways, patios, and other flooring structures that are made from concrete typically have more dust buildup, regardless of how many times they are swept. This material, specifically, is often more porous than other building materials and can withhold higher amounts of residue in their pores. Although not all concrete is the same, we approach it with similar cleaning methods that are then tailored to the concrete’s needs. Whether it’s driveways that need oil stain removal or roads that require sand removal after Winter, all of these can be achieved with pressure cleaning tools and techniques. Keeping your concrete clean has many benefits that relate to its overall functionality and aesthetic appeal. As some debris is not easily visible on concrete’s surface, deep cleanings help ensure that such dirt and bacteria is also removed from the surface, leaving the concrete to have a brighter appearance its surface and color tone. Regular cleanings are also needed to help concrete from becoming susceptible to cracking, as too much buildup over time can lead to the pores breaking or forming cracks. Pressure cleaning can keep your concrete surfaces smooth, debris-free, and can give them a refreshing finish that looks good as new. Not only does regular deep cleanings keep your concrete looking refreshed, but it also helps increase the longevity of your concrete. Regular maintenance is important to have a concrete surface that can last for many years and helps avoid future costs that are associated with concrete repairs or replacements, making pressure cleaning a more durable maintenance option. To avoid personal hazard or injury to yourself, it is always advisable to enlist the help of professional cleaners to clean your concrete. Pressure cleaners typically require some training and skills operate, making them hazardous to individuals who are untrained or unaware of how to use them. Professional cleaners help to make the concrete cleaning process easy, stress-free, and effortless on your behalf. You shouldn’t ever attempt to clean concrete with a pressure cleaner if you’re unsure how to do so. Our cleaners are not only qualified, licensed cleaners, but we’re also a team of professionally trained experts that have experience in the field. Save yourself the hassle and contact us to clean your concrete for you!